Approaching the end of this year, it is gradually getting cold in the area where I live. How is your country? The convenience store in Japan released new arrival sweets one after another. Now, let me show you Japanese convenience store’s new arrival sweets this time. Let‘s check it out ! This sweets is a deep-fried and filling bread with bittersweet cocoa flavor. It’s thoroughly fried with coppepan dough, and really melts in our mouth. This is putting a fluffy textured omelette with potato and Boronian sausage between slices of muffin. Cheese and tomato sauce are also inside and tasty ! The appearance of Pie Éclair is like a bagworm, but it’s so tasty ! This sweets is filled with thick and smooth caramel custard cream. It’s recommended for sweet tooth people. This sweets is pouring a special berry sauce and a thick cheese sauce on top of rare cheese mousse, and is suitable for winter. This choco éclair is used two kinds of chocolate whip with Belgian chocolate powder and rich, melty chocolate ganache. The outer puff is also appetizing. This is a new release of MINISTOP CAFÉ and is used gingers produced in Kouchi, cinnamon, cardamom and clove. Milk tea based on this beverage is Assam tea and Hokkaido fresh cream. Strawberry fruit juice is used for secret ingredients. Squeezed whipped cream is in a soft bread roll and fragrant chocolate is on the surface. This is a cream daifukumochi used Uji matcha made by Tsujiriichi Honten, long-established Japanese tea maker. Creamy matcha cream and “Yumemurasaki “, adzuki beans produced in Hokkaido are used in it. It is an irresistible item for matcha lovers. Agepoyo (strawberry flavor) will be released from Dec.27 sequentially. This is a sweets stuffed cream based on strawberry jam inside a chewy dough. You can enjoy sweet and sour taste’s chou. This is also chocolate Agepoyo which was already released and is very popular. You will surely be pleased with the chewy elasticity ! There are two kinds of Daifukumochi in Geishun Mochitoro Kouhaku. One is a white Daifuku wrapped melting vanilla whip in a soft rice cake dough. 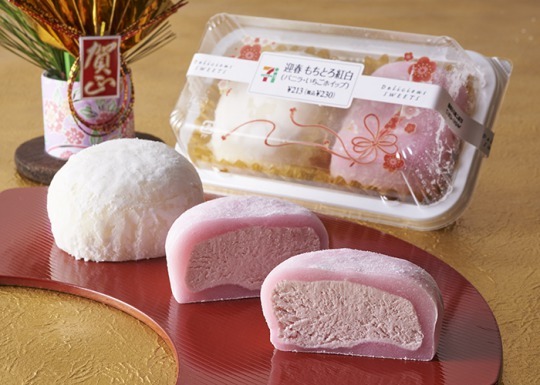 The other one is a red Daifuku wrapped creamy strawberry whip in. It’s a red and white New Year’s Day sweets. Do you feel like eating these convenience sweets？ I really like them ! There are some sweets which you can’t purchase, but if you have chance to have, try to eat them ! Who rescued a baby? ―it’s an amazing story that Siri help human’s life― Share your experiences with “Facebook 360 photos”! A very small wallet “SWAGgear” will change the concept of wallet! Do you know how to make hydrogen water? The bottle which produces it simply with water or tea, ‘Pocket Premium’, is released by Kyowairyo The top five ‘High-Quality Bluetooth Headphones’ recommended by the audio-visual critic Let’s play “Pokemon GO” at a McDonald’s store! New Flavor for Japanese Famous “Super Cup Ice Cream” is Now Available! Show Off Your Character through SNS Profile Picture! !